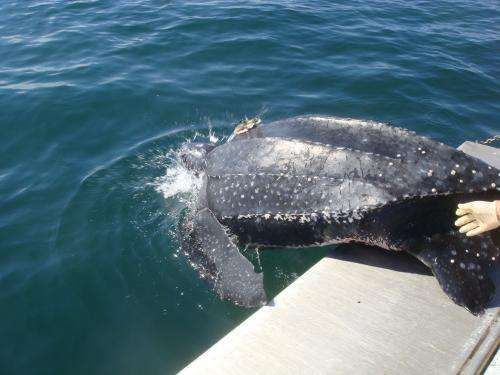 A first-of-its-kind satellite tagging study of migrating New England leatherback turtles in the North Atlantic offers a greatly improved understanding of their seasonal high-use habitats, diving activity and response to key ocean and environmental features in relation to their search behavior. Leatherbacks are considered endangered species in all the world's oceans. The study, part of doctoral research by Kara Dodge supervised by her advisor, Molly Lutcavage of the University of Massachusetts Amherst's Large Pelagics Research Center (LPRC) in Gloucester, followed leatherbacks in their northern US feeding grounds. It allowed for a rare glimpse into the migratory patterns and behavior of immature and adult male turtles. Most satellite tagging studies of leatherbacks have focused on adult females on their tropical nesting beaches, so little is known worldwide about males and subadults, the researcher point out. But now, tagging and satellite tracking in locations where leatherbacks forage has allowed the scientists to get a much richer picture of the leatherback's behavior and dispersal patterns on the open ocean. Findings suggest that a habitat model that includes ecoregion, topography and sea surface temperature best explains the leatherbacks' search patterns for prey. The tagged leatherbacks in this LPRC-led study showed a strong affinity for the Northeast U.S. shelf during the summer and fall when full-sized jellyfish are present. New knowledge about leatherbacks, particularly in coastal habitats, is important, the authors say, because "coastal ecosystems are under intense pressure worldwide, with some of the highest predicted cumulative impact in the North American eastern seaboard and the eastern Caribbean. Parts of those regions constitute high-use habitat for leatherbacks in our study, putting turtles at heightened risk from both land- and ocean-based human activity." Lutcavage and colleagues' findings appear in the current issue of PLOS ONE. These will be useful to agencies such as the National Oceanic and Atmospheric Administration (NOAA), U.S. Fish and Wildlife Service and the Massachusetts Division of Marine Fisheries (MassDMF) charged with protecting leatherbacks under international treaties and national laws, and in international efforts to protect leatherbacks throughout the North Atlantic. Lutcavage, Dodge, and Ben Galuardi of the LPRC, with Tim Miller of NOAA, set out to determine how leatherbacks behave in distinct regions, or "ecoregions" of the North Atlantic, as well as their diving habits in those areas and other new information. For this study, supported by LPRC, NOAA Fisheries, National Fish and Wildlife Foundation, and MassDMF, the team worked with commercial fishermen, spotter pilots and the Massachusetts sea turtle disentanglement network from 2007 to 2009 to tag 20 leatherback turtles off the coast of Cape Cod. Leatherbacks have long been known to inhabit New England waters, says Lutcavage. "We started the satellite tagging work in 1994, but had little understanding of their daily lives until recently because we first wanted to develop ways to directly attach the tag without encumbering the turtle." "Once that was accomplished, we could collect accurate track locations via GPS along with dive data, and determine the leatherbacks' residence time, high-use habitat and behavior on the Northeast US shelf and beyond," she adds. The research team also examined environmental features, including bathymetry, or depth information, plus remotely-sensed temperature and ocean productivity data to understand leatherback habitat preferences. Dodge says, "Our study provides new insights about how male and immature turtles behave, how they use their habitats and how that differs from adult females. Resource managers for protected marine species have lacked this key understanding, especially in coastal regions of the U.S. and Caribbean where leatherbacks and intense human activity coincide." Leatherbacks are the largest turtles in the world, weighing up to 2000 pounds and up to seven feet long. They are warm-bodied, deep divers that can descend below 3000 feet. They have the widest global distribution of all reptiles and are the most migratory sea turtle species, traveling thousands of miles between feeding and breeding grounds. Unlike other sea turtles, leatherbacks exclusively eat soft-bodied gelatinous zooplankton such as jellyfish and salps. Their pursuit of patchily distributed "jellies" and unique thermoregulatory ability contributes to their expansive range.